Strategies for studying gene regulation mechanisms have changed dramatically over the past several years in light of the emergence of complete genome sequences for many organisms as well as the development of or improvements to technologies such as chromatin immunoprecipitation, RNA interference, microarrays, and proteomics. The first edition of the highly successful Transcriptional Regulation in Eukaryotes, written by Michael Carey and Stephen Smale at UCLA, provided a comprehensive source of strategic, conceptual, and technical information for investigating the complexities of gene regulation at the level of transcription. With the ever-increasing importance of genome data and the appearance of new and better techniques, the second edition of this book has added a third author, Craig Peterson at the University of Massachusetts Medical School. In addition to a new chapter on the in vitro analysis of chromatin templates for DNA-binding studies and transcription, this second edition has been extensively rewritten and updated to discuss new advances in the field and their impact on gene regulation mechanisms. 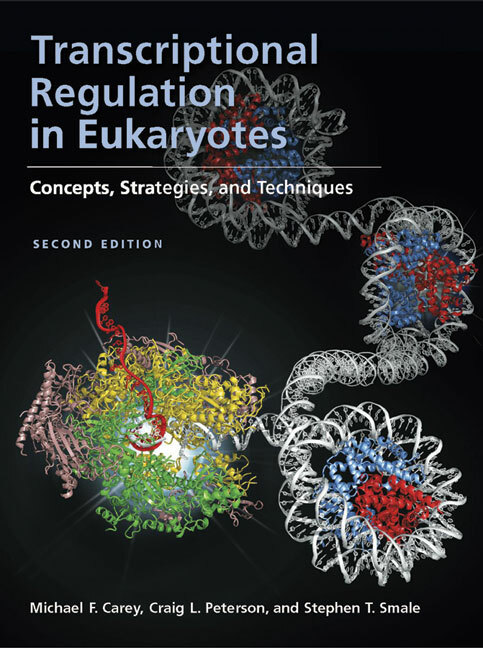 The second edition retains the approach of the first in covering both the conceptual and practical aspects of how to study the regulation of a newly isolated gene and the biochemistry of a new transcription factor. This important and unique book is essential reading for anyone pursuing the analysis of gene expression in model systems or disease states, providing underlying theory and perspective to the newcomer and the latest techniques to the expert.